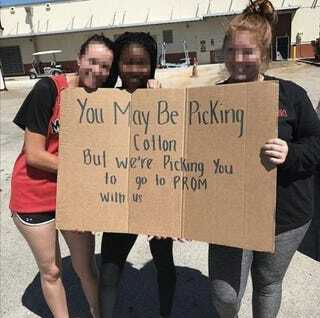 Two white South Florida high school students have been suspended after a photo of a racist promposal went viral. One of the fathers said that he understands the controversy over the sign and why it may appear to be racist, but he said that there was no malicious intent behind the sign and that now the girls are afraid to go to their prom. The girls, who attend Monarch High School, have been suspended pending the completion of an investigation into the incident. The other father said that he hopes everyone hears the “true” story. But I’m interested in your thoughts, people. Do these new facts change your perception of the promposal? Is the joke more acceptable because the black student is actually the heir to a cotton farm? Or is this just all kinds of nopes for you?